Interesting Tales of Great People Who are as Ordinary as Us! Someone asked me about some great Indians. I didn’t take me even a minute to recall the names of cricketers, freedom fighters, film stars, politicians and billionaires easily. I am sure it must have happened with you too in some point of time. But have you heard of a certain Annadurai who rides an auto that has a mobile charger, free Wi-Fi, books, magazines, and newspapers for passengers? And, there is also Rajesh Kumar Sharma, shopkeeper, one who takes a couple of hours off to teach labourers’ kids under a Delhi metro bridge every day for free! These are some amongst the many names who go without recognition even after making a significant change in society. Here are 15 such Indians who deserve to be known for their noteworthy contribution to society. She was a flight attendant for Pan Am airlines, based in Mumbai, who was murdered while saving passengers from terrorists on board the hijacked Pan Am Flight 73 on 5th September 1986. This happened two days before her 23rd birthday. Not just had she assured the failure of the hijacking by preventing the plane from getting off the ground, but she also saved the lives of hostages in those long hours of incarceration. 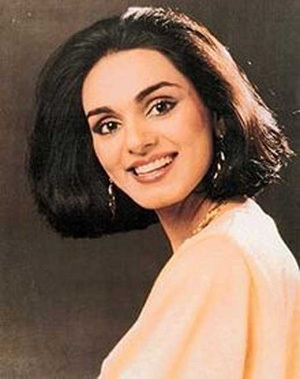 Neerja hid the passports of American passengers from the Arabic speaking gunmen, thus giving them a chance to escape the homicidal wrath of the intruders. Ashok Chakra Award (India’s highest gallantry award for bravery in the face of the enemy, during peace time), being its youngest recipient. Indian Civil Aviation Ministry’s Award. Also, in 2004 the Indian Postal Service released a stamp commemorating her. A true hero! 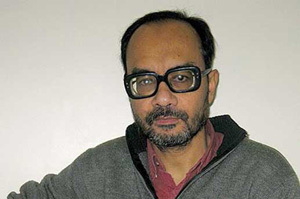 Physicist Ashoke Sen is one among the 9 recipients of the Fundamental Physics Prize. This is considered as one of the greatest honour in the field of Physics. Sen is currently a scientist at the Harish Chandra Research Institute in Allahabad. He has received the $3 million prize for pioneering work on string theory, an effort to complete a task that Einstein had begun, and an attempt to unify the theories of gravity and quantum mechanics. Sen might have won a Nobel Prize if string theorists were allowed to! In 1998 he won the fellowship of the Royal Society and his name was nominated by none other than Stephen Hawking. A physicist born in India, nearing 90, he is currently spending his retired life in the US. He pioneered in the field of Fiber Optics way back in 1960s. Well, even the term “Fiber Optics” itself was coined by him. Kapany was included in the list of “Seven unsung heroes” by the Fortune Magazine. Charles K. Kao was awarded Nobel for his ground- breaking work in Fiber Optics (done in 1966) In 2009. 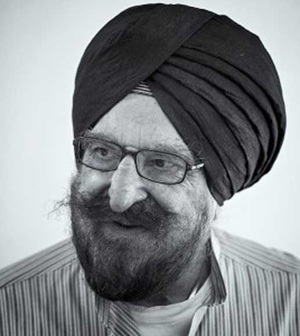 But Dr. Kapany received just a mention for his work by the committee, when he had demonstrated transmission of light in fiber optics more than a decade ahead of Kao. We owe a lot to this man who paved way for internet, high speed data transmission, advanced surgeries, and much more. His main goal is to provide customer satisfaction. 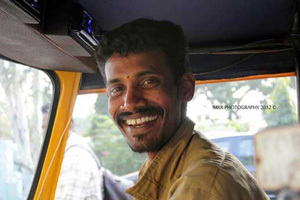 His vehicle is Wi-Fi enabled and if you’re not carrying a laptop or smartphone to connect to the internet, then Annadurai will slip you a 10-inch tablet! He carries an internet dongle attached to a Wi-Fi router and offers free access to the internet. ‘Most people who take my auto work for IT companies and I know access to the internet is important for them’, said Annadurai, adding, ‘It takes about half an hour to cover the distance between Thiruvanmiyur and Sholinganallur, then why waste that time?’ says Annadurai. Annadurai spends Rs.4, 000 a month on subscriptions to 35 various news publications. 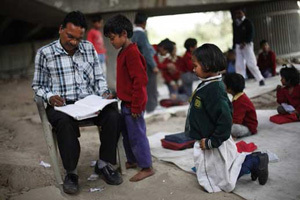 Rajesh Kumar Sharma, aged 40, provides free education to New Delhi’s slum children under a metro bridge. Sharma started a makeshift school, and here he teaches children from the city’s slums, who are too poor to attend regular schools. Sharma writes on black boards painted on building walls, at his free school run under the metro bridge. At least 30 children living in the nearby slums have been receiving free education from this school for the last 3 years now. He runs a general store in the city as well, but for 2 hours a day he rushes to his improvised outdoor school. Who would have thought of such a noble idea in such settings if it wasn’t for Rajesh and the dozens of children who go here daily! It is just the bridge acting as a protecting roof in case of rain, but how does that matter when the cause is so noble! Col. Narendra Kumar or ‘Bull Kumar’s heroic deeds ensured that the Siachen Glacier became a part of India. This was during Operation Meghdoot that was launched by the Indian Armed Forces to capture the Siachen Glacier to establish a critical wedge between PoK and area occupied illegally by China after 1962. This expedition to climb the glacier was lead by Col. Kumar. He is an internationally known mountaineer. In 13 of the highest peaks above 24, 000 feet climbed by Indians, 9 have been climbed under his leadership alone. Colonel Kumar is the only Indian to have commanded three premier mountaineering institutes of the country. He was the first man in the world to cross the Siachen Glacier from the snout to its source. His unique contribution towards the world of mountaineering was the ascent of Kanchenjunga from the North East spur, which is considered to be a greater feat than climbing Mt Everest. 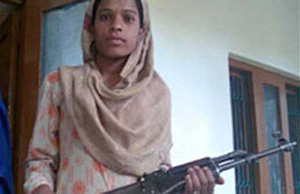 Rukhsana Kausar is known for shooting an LeT militant at her home in Rajouri district of Jammu and Kashmir. A Class 10 dropout, Rukhsana has been awarded the India National Bravery Award, for killing of a Laskar-E-Taiba militant leader at her residence. For this, she used an axe and an AK47 rifle. point Rukhsana emerged from her hiding place with an axe and hit the LeT commander on his head. One of the militants opened fire, causing injuries to Waqalat Hussain in his arm. Seeing this Rukhsana picked up the commander’s AK47 rifle. She also retrieved another from the other militant and threw it to her brother. She then shot the commander and killed him, and she and her brother fired on the other militants too, forcing them to flee. Dr. Ravindra Koelhe (MD) lives and runs a clinic in Melghat, in Maharashtra. Dr. Koelhe’s fee is Rs.2 for the 1st consultation and Rs.1 for the 2nd. Not just a doctor, but he is also a social worker. He was first recognized after he filed a case against government who failed in its duty to protect the Korku tribals of the region. Jankidas Mehra was a champion cyclist of world fame. He broke the 8th world cycling records between 1934- 42. Mehra also represented India in the world Olympic Games at Berlin in 1936. 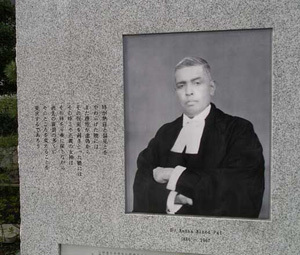 He was India’s sole representative at the empire games in 1938 in Sydney, and at the eastern games in Tokyo, in 1940. 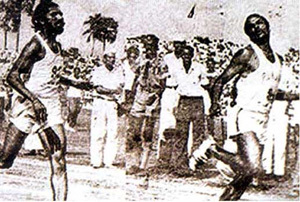 Finally before the world sports congress meet in Zurich he met Mahatma Gandhi who put him in a moral dilemma by asking, “Do you want to represent British India?” At the meet Mehra quietly untied the British flag and hoisted India’s national flag (pre-independence) and became the 1stIndian to have done this. After this act against British occupation, Mehra was hailed a hero but the controversy forced this sports person plus freedom fighter’s sports career to end. He became a well-known writer, a noted actor (from whose Mumbai estate Sanjana Kapoor’s Prithvi theatre now operates), and a director. 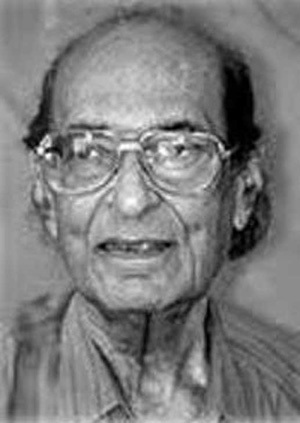 Mehra passed away in Mumbai on June 18th, 2003, when he was 93. In 2010, Roy was among the 100 most influential people in the world according to the TIME magazine. The founder of the Barefoot College movement in India, Roy has empowered the people of a drought prone Tilonia and created a self-sustained economy for its natives. The amazing things happening in Tilonia would leave you spell bound. There they now produce their own electricity via solar panels, and manufacture their own lighting equipment, even microchips! The amazing fact is these awesome microchips and solar panels are developed by women who are either illiterate or have received very little education. This stopped migration from the villages entirely, as now they are self-sustained! 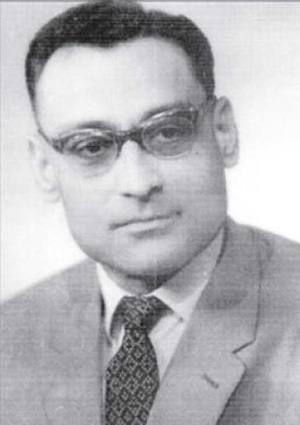 Rameshwar Nath Kao was a spymaster and the first chief of India’s external intelligence agency- Research and Analysis Wing (R&AW) from its founding in 1969 -77. 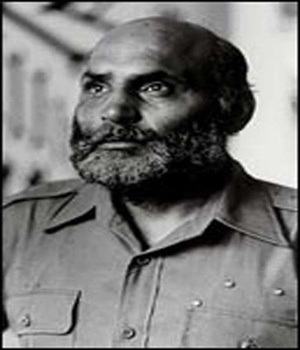 Kao was one of India’s foremost intelligence officers and helped build R&AW. He held the position of Research Secretary in the Cabinet Secretariat of the Government of India. During the course of his long career, he also served as the personal security chief to Prime Minister Nehru and as security adviser to Prime Minister Rajiv Gandhi. Kao also founded the Aviation Research Centre (ARC) and the Joint Intelligence Committee. 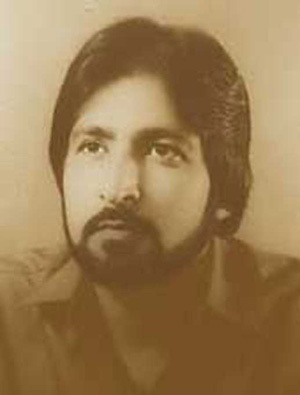 Kao, an intensely private man, was rarely seen in public post- retirement and was photographed only twice throughout his life..
Ravinder Kaushik was born in Sri Ganganagar in Rajasthan on 11th April 1952. Kaushik was a famous theater artist and displayed his talent at the national level dramatic meet in Lucknow. It was witnessed by some officials of the Indian Intelligence Agency RAW. Thus he was contacted and offered a job for being an undercover agent of India in Pakistan. At 23, he was sent to Pakistan on a mission. Ravinder Kaushik was recruited by RAW and was given extensive training in Delhi for 2years. In 1975 he was sent to Pakistan and given the name Nabi Ahmed Shakir. Kaushik was successful in getting admission in Karachi University and completed his LLB. There he joined Pakistan Army and became a commissioned officer and later was promoted to the rank of a Major. There he married a local girl Amanat. In 1979 – 1983, while in military service, Kaushik passed on valuable information to RAW which was of great help to the Indian defence forces. The then home minister SB Chavan gave him the title of India’s ‘Black Tiger’. He spent 26 years of his life away from his home and family in Pakistan in very unfavourable conditions. At many occasions Pakistan prepared to wage war across the borders of Rajasthan, but they were foiled due to the timely advance warning, as Kaushik was a senior military officer in Pakistan by now and had access to top secret information. In September 1983, the Indian intelligence agencies had sent an agent, named Inyat Masiha to get in touch with Black Tiger. But Masiha was caught by Pakistan’s intelligence agencies and there he revealed Ravinder Kaushik’s true identity. Sooner Kaushik was captured and then tortured for two years at an interrogation centre in Sialkot. He was awarded death sentence in the year 1985 ad his sentence was later commuted to a life term by the Pakistan Supreme court. He was kept in various jails, like Sialkot, Mianwali and in Kot Lakhpat for 16 years, and there he contracted TB and Asthma. He managed to secretly send letters to his family in India that revealed his poor health condition and the trauma faced by him in Pakistani jails. 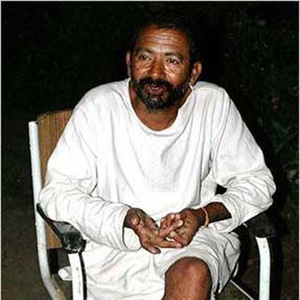 On 21st November 2001, Kaushik succumbed to pulmonary tuberculosis and heart disease in New Central Jail Multan. Later, he was buried behind that jail. 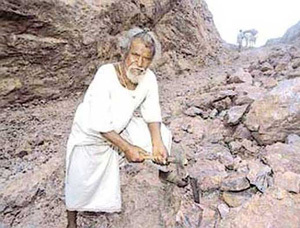 Dashrath Manjhi, known as Mountain Man of India, was born in a poor family in Gahlour village near Gaya in Bihar. Falguni Devi, Manjhi’s wife, was once very sick and she needed medical treatment urgently. The nearest town with a doctor was 70 kilometers away from their village in Bihar. Unfortunately Manjhi could not help her get medical treatment in time due to the long distance and she died. He did not want anyone else to suffer the same fate as his wife, hence he carved a path 360- foot- long (110m), 25- foot- deep (7.6m) and 30- foot- wide (9.1m) to form a road through a mountain in the Gahlour hills He worked day and night for 22 years from 1960 to 1982, for this. His feat reduced the distance between the Atri and Wazirganj blocks of the Gaya district from 70 km to 1 km, thus bringing him national acclaim. Manjhi died on August 17th, 2007 and was given a state funeral by the Government of Bihar. Many would think, and it is quite natural to think that way, that Makhan Singh, like Milkha Singh, must have lead a very cosy life, and enjoyed constant fame and money. But the reality was quite the opposite. His life took a turn for the ugliest when he retired from the services and athletics. “Rana”. He used to stay with his family in a rented house in Nagpur. Initially, he used to drive trucks on contract for someone, but eventually, he got his own truck by getting a loan from the bank. But fate had something else for him in store and he met with an accident on 28 October, 1990. He spent several days in the hospital but his wounds on the leg were getting worse day by day. Ultimately his leg was amputated on 28 November, 1990. In 1998, Singh asked a politician for a gas agency allotted to him but the man demanded a bribe from one of India’s finest athletes! In 1999 he went to meet the Railway Minister in New Delhi to get a complimentary pass that Arjuna Awardees are entitled too. Conversely, he could not even get beyond the security guards. Worser still, to protect the future of her family, his wife finally gave up and offered to sell her husband’s various medals and awards, including The Arjuna award. By this time, government was forced to wake up from its slumber by Sushma Swaraj, and she took the cause of the plight of his family in the Parliament. After that some respite followed, but thinking about the man, he lived a very unfair life. After the bombing of Hiroshima and Nagasaki by the US, Empire of Japan surrendered to the Allies in 2 September, 1945. A Tokyo trial or the Tribunal was convened by the Allies to try the leaders of Empire of Japan for crimes of war. 28 Japanese military and political leaders were charged with Class-A crimes, plus more than 5, 700 Japanese nationals were charged with Class- B & Class-C crimes, and this entailed prisoner abuse. The Country of China held 13 tribunals of its own, which resulted in in 504 convictions and 149 executions. The only dissenting voice in the Tribunal was of Justice Radha Binod Pal. Pal was the only one who submitted a judgment which insisted all defendants were not guilty. Pal argued that the trial was simply an act of retribution by the Allies rather than an impartial judgement. He staunchly believed that the exclusion of Western colonialism and the use of the atomic bomb by the United States from the list of crimes signify failure of the Tribunal to provide anything other than the opportunity for the victors to retaliate. But his argument was ignored and his opposition was banned from publication. And only after the American Occupation of Japan ended in 1952, this ban was subsequently lifted. « Virtual IIT Degree: Soon a Reality!